Chlorine is the key ingredient of polyvinyl chloride (PVC) widely used in pipes, siding, roofing membranes, wall covering, flooring, and carpeting. Chlorine is also an essential feedstock for epoxies used in adhesives and flooring topcoats, and for polyurethane used in insulation and flooring. Different technologies used to manufacture chlorine and PVC use a variety of the world’s most problematic chemicals. A necessary first step towards reducing the environmental health impacts of chlorine is to create a public global inventory of chlorine, vinyl chloride monomer and PVC producers. 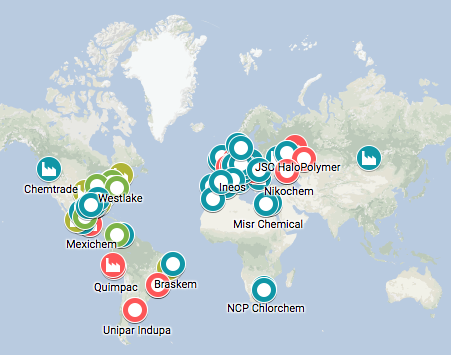 Healthy Building Network’s Chlorine & Building Materials project delivers an open access accounting of the technologies, markets, and pollution associated with chlorine production around the world. Phase 1 of this project (released in July 2018) covers North and South America, Africa, and Europe. Links to Phase 1 products, including maps, spreadsheets, and a detailed report, are found below. Phase 2 (released in March 2019) covers Asia and includes global findings. The Chlorine & Building Materials project was supported in part by subscribers to our Subscription Research program. Current subscribers include: Carnegie, Designtex, Humanscale, Interface, Metroflor/Halstead, and Tarkett. Do you have a research topic that would benefit multiple stakeholders? Building product manufacturers and others can “crowd-fund” research through HBN’s Subscription Research program. For further information, including subscriber benefits, please contact subscriptions@healthybuilding.net. If you are interested in supporting HBN Research, donate today. Download the Phase 1 report using the "download pdf" at left, and see supplemental information below.